In April of 1982, Argentina invaded the British sovereign territory of the Falkland Islands, in the South Atlantic. The Argentines had long claimed ownership of the islands, which they called Islas Malvinas. The unforeseen attack and occupation sparked international outrage, and Great Britain quickly mobilized a naval task force to retake the islands, 8,000 miles from home. Relying on the élan of their professional and highly trained military personnel, the combined air, sea and land forces succeeded against the odds, victorious less than 80 days from the Argentine seizure of the islands. For the British, it was no less than a spectacular feat of arms. 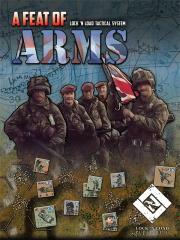 A Feat of Arms is an expansion module for Lock ’n Load Tactical: Heroes of the Falklands. Play 12 scenarios on six new X-Maps, including a new Port Stanley Map for a revised take on Operation Rosario, the initial Argentine invasion. Other new terrain includes rugged hills—for new battles on Mt. Harriet, Wireless Ridge and Sapper Hill—and a grass airfield, for the SAS’s audacious raid on Pebble Island and the ferocious final action of the Battle of Goose Green. Across the islands, the bold British Paras and Royal Marines fought well-armed Argentine Army conscripts and Marines defending vital terrain and counterattacking upon lost ground. The conditions were harsh, with most of the fighting done at night, among minefields and under heavy mortar and artillery fire. The Falklands War was a test of mettle. Are you up to the test? Requirements: To play A Feat of Arms you must own Lock ‘n Load Tactical – Heroes of the Falklands.